The world of copier sales can be overwhelming at times but if you are looking for help in the Albuquerque area then we are here to help ease your fears. 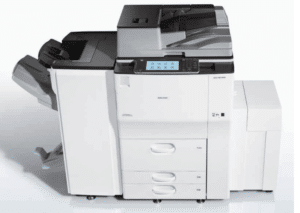 We carry only the best brands from Ricoh, Kyocera, and HP to make sure that you get the right machine for the right job. Our reps are trained to look at the specific needs of your business and choose the right machine to get the job done. Whether you are a high volume marketing agency that needs a consistent, fast, and color oriented copier or a smaller office that simply needs a reliable black-and-white printer, we are here to help. Most copiers are now compatible with the cloud and offer ease and security for the modern-day business environment. Albuquerque Copiers knows that a reliable copier and printer is paramount for your business to run the way you want, and we are dedicated to helping you find the machine that fits your needs. We know how to help you get the most for your money and save you the valuable time you need. Contact one of your representatives today to learn more about what machine would benefit you the most, and let them know what your current contract is like so we can see if we can help you find a cheaper option in the future.